Denim is one piece of attire that has always been in trend irrespective of the time and era. If your wardrobe too is filled with the latest styles but you find yourself clueless about the best way to pair the staples, this post is definitely an excellent solution to your fashion faux pas. From mom to boyfriends jeans to cropped kick-flares and deconstructed vintage and customized pairs (think Vetements), we have a trendy solution for each and all. More commonly described as the comfortable high-waisted jeans, mom jeans can be efficiently paired with shirts, blouses, t-shirts and oversized knits. The jeans look good with both a folded ankle cuff or tapered leg style. Oversized and often with a turn-up option, boyfriend fit jeans with their relaxed and lived in look can suit well with almost all body types. The key to a perfect pair is to make sure the shape is flattering to your body type and does not look too sloppy or too nice and fitted. Boyfriend fit jeans look great with fitted shirts and layered outerwear pieces. Made popular by Vetements, the deconstructed vintage denim give the look of denim sewn back together to reveal quirks like uneven hems and poker fading. The intentionally ripped trousers and layered separates bring back the edgy trend into the spotlight. The deconstructed vintage jeans look casual as well as trendy in both light and bold shades. Pair your vintage jeans with stripes and pointed heels for a put together and composed look. A bootcut flare chopped just above the ankle gives the jeans and the wearer the maximum liberty to experiment with the styles. 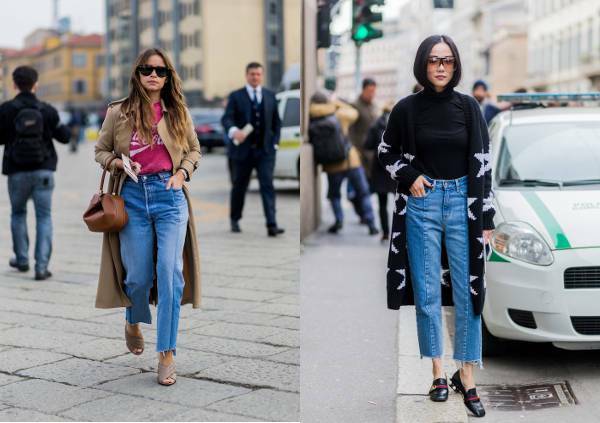 Whether it is with a tapered or fringed edge, the jeans look good in almost every cut and style. You can also go the edgy route by choosing a bootcut with a deep ankle slit. Pair the jeans with a fancy blouse and statement jewelry for a casual and pretty look. With the embroidery and printed fabric trend running high this season, it is a must to own a customized pair of jeans in your closet. Whether it is accessorized with badges, embroidery, rivets or as a matter of fact anything fun, customized pair of denim can always turn around the look of the staple and solid blouse and even bring in the missing fun and whimsy to the outfit. Make the most of the pairs in your closet by choosing the right cut and fit and pairing them with the fashionable and appropriate top.